Benugo at John Lewis | Then there were three.. I will admit, I was very nervous; it was my first event and I was worried I would be picky with the food. Luckily, a friend and fellow blogger was also heading to the event with her two children so I knew someone there. With regards to the food; I needn't have worried - it was superb. Benugo Cafe is located on the first floor of John Lewis in Cardiff City Centre; I don't think I have ever really stepped foot inside John Lewis - I would absolutely bankrupt myself so tend to steer clear! When we arrived a table had been set up for all of us bloggers and our little ones who were also invited along! The first thing I noticed about Benugo was how light it was in there; for once we had some sunshine in Wales and the floor to ceiling glass windows certainly took advantage of that! After some chatting with fellow bloggers, it was time to tingle our taste buds! First up was Benugo's Spring cous cous; I am a lover of cous cous and luckily Aoife is too! 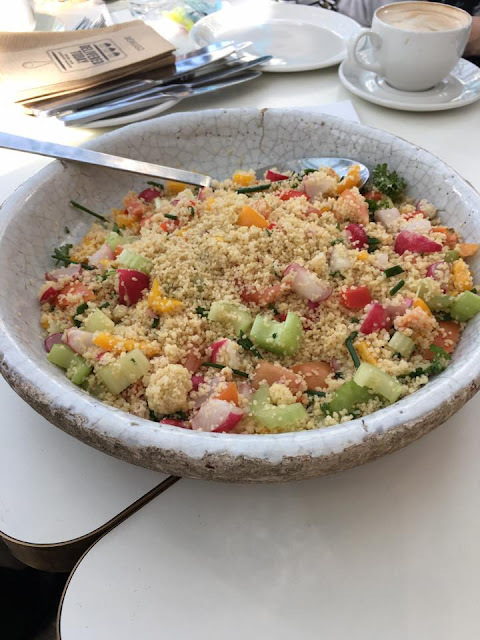 The cous cous contained celery, radish, tomato, peppers and fresh herbs - it certainly went down a treat! 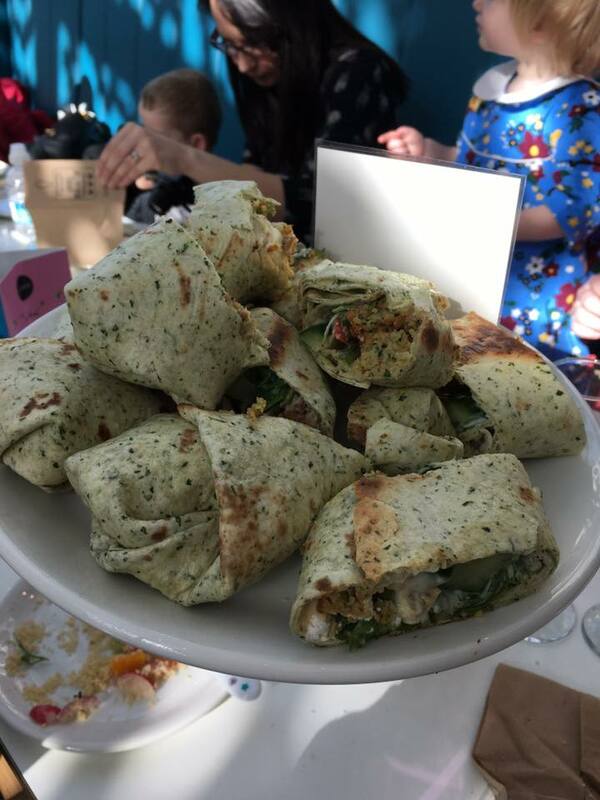 Next up came the wraps and sandwiches; there was plenty of variety for meat eaters and vegetarians too! The wraps that we got to try were the Basil Chicken and Nduja wrap (still have no clue on how to pronounce Nduja!) and the Middle Eastern Wrap with Spinach Falafel. I will admit, I was sceptical about the later - I've never tried spinach however I was pleasantly surprised - I will definitely be getting it next time I'm in Cardiff! The sandwiches; oh the sandwiches! They were amazing. Literally amazing. We tried out three different options and one of them completely stole the show for me. 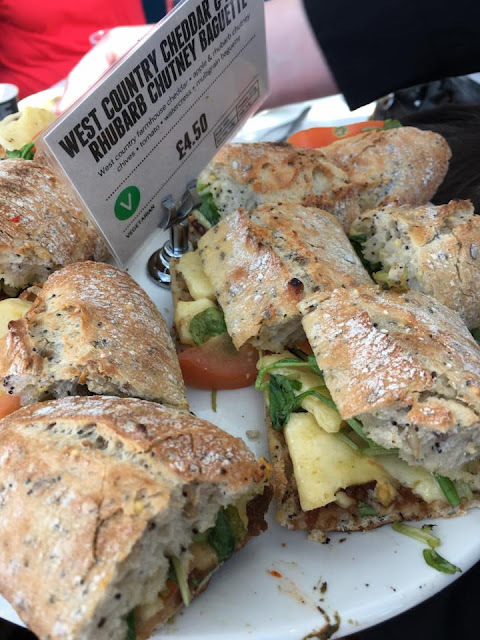 Firstly we got to test out the classic Ham and Emmental Cheese baguette - let's be honest, you can never go wrong with a ham and cheese baguette can you? Next up came the Chargrill Chicken and Basil Aioli baguette and finally, the star of the show; the Cheddar and Apple Rhubarb Chutney baguette. Now, I will admit that if I walked into a cafe I would never, in a million years, go for this option. It's not something I would think went together in a baguette. Boy was I wrong - I'm sat here typing this post at 10pm a week later and my mouth is watering just thinking about it. You definitely have to try it if you are popping in! Finally, desserts - Aoife's favourite part! 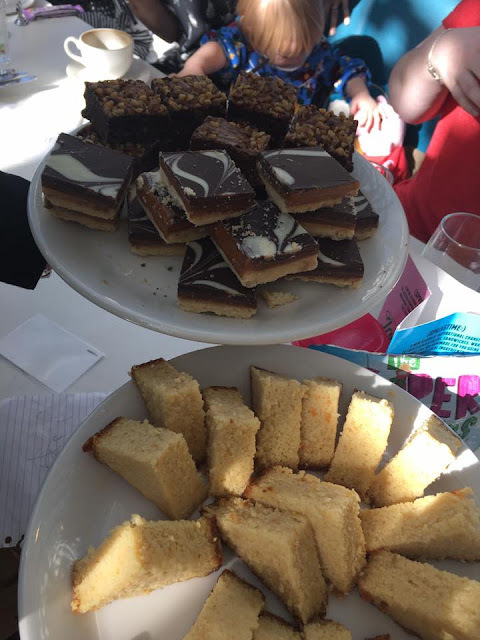 We were spoilt with chocolate brownies, lemon cake and millionaire's shortbread. 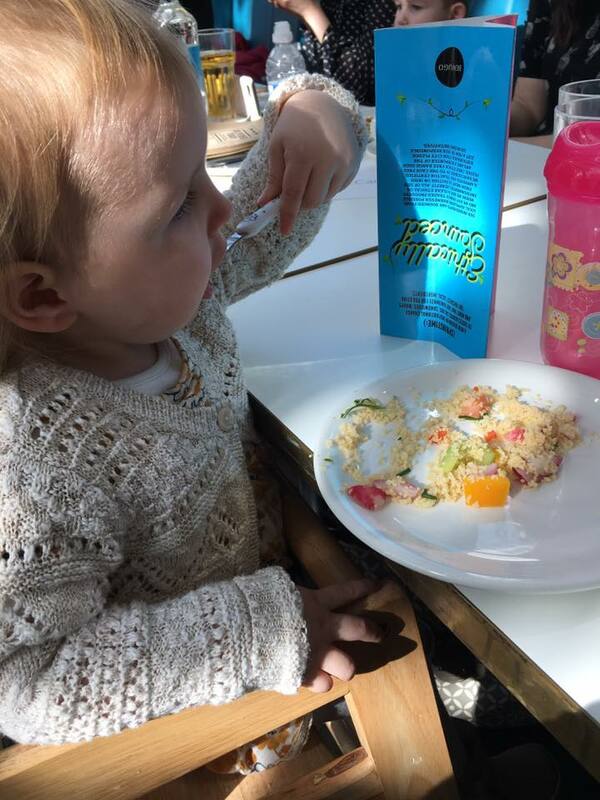 Aoife managed to wolf down two slices of lemon cake before I could even blink so I guess she enjoyed it! Benugo also serve delicious tea and coffee; now as most people know, I'm not a tea or coffee drinker (yes shock horror!). However, I decided on a Mango and Strawberry fruit tea. I honestly couldn't fault it; I managed to get three cups of tea out of the pot and it was so refreshing. I can't wait to head up to Cardiff again as I will definitely be dragging my husband to Benugo to get my hands on this food again. If you are in the area I would definitely recommend popping in too! Thanks for having us Benugo! *Disclaimer: I was invited to Benugo to try their new Spring menu. All opinions are my own honest ones. The food looks delicious. So glad you and Aiofe enjoyed. Think we'll head there next time we're in Cardiff!